Getting an angry cat into a carrier is a hard task. Most cat owners will confirm it. But what about your cat going in it on his free will? Many of you probably grab your head now and say that it is not possible. Here’s a little surprise to you. It is possible to train a cat to go inside a pet carrier. On his own free will. We are not gonna lie to you, it is hard, very hard, but possible. In some cases, when a kitten has no previous experience with the carrier, it is as easy as saying: “One, two three!” However, if you are encountered by a feral cat, who lived in a medium distance from humans, or even has been abused in his early life, you should consider if you really want to get him in there. Of course, nothing is black, or white. 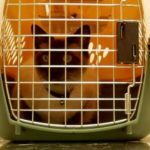 Most commonly problems arise when household cat visits veterinary into his carrier, and every time getting him in there becomes a struggle. This is when the cat associates carrier to something bad. First, your cat must form new associations to the carrier. If you want to get your cat into it voluntarily, it necessary that he sees no torturing device in it, but an everyday item instead. The best way to do it would be removing the door off the carrier and placing a soft blanket inside. Next, place the carrier somewhere in the room your cat spends most of his time, and, most important, don’t make a fuss out of it. If your cat changes his habits and spends time in the particular room no more, the carrier is too close. Move it in a more distant corner or maybe to the other room, which is occasionally visited by your cat. Now, just leave it there and do not force your cat’s attention to it. Depending on your cat aversion level, it may be necessary for days, weeks or even months. Play with your cat in the same room like if the carrier was not there. And only when your cat is able not to pay any attention or shows a positive curiosity about the carrier, move forward. 3. Treat your cat near the carrier. Next, place few treats on the floor somewhere in the middle between your cat and the carrier. Do not make a big deal about it, and go away yourself. Cat knows you are the one who puts him into a carrier, so, if you are not around, he may feel more secure. Now, if your cat ate the treats, gradually move forward, but if he did not touch them, you may increase the distance to the carrier. Adjust it each time you give them depending on your individual cat, and even depending on the time of the day, as, right after the meal, treats will not be as good stimulation. Gradually, move closer and closer to the entrance of the cat carrier. You may also create a pathway of treats that leads to the carrier, and inside of it. What we want to achieve is that when you place a treat inside the back of the carrier, your cat goes into it, eats the treat and leaves. Most likely you will have to repeat, repeat and repeat it, adjust, adjust and adjust the distance between the carrier and the treats. Depending on every cat, this step may take days, weeks or even months to master. Now that your cat is able to go inside the carrier with you being present, you may put the door back in. Initially keep them open and repeat the step three for some time again and again. When you think your cat is comfortable with the carrier, close the door for a very short time. Five seconds would be enough in the beginning. This may, or may not increase the fright of your cat, so you will either have to keep practicing him going in and out without closing the door, or you may gradually increase the time the door is closed. When your cat comes out of the carrier, don’t forget to pet, praise or play with him. He must know it’s okay. 5. Pick the carrier up, and gradually habituate your cat to moving around. Now we are ready to move to the dreadful part. You honestly want to pick the carrier up. If you got this far right, your cat may not be that much afraid. However, keep watching his attitude. Carry the carrier round the same room, put it back in a same spot it was and open the door. Once again, praise, play and (or) pet. Gradually increase the time you spend carrying the cat into a carrier. You may go in the next room, then back. You may carry your cat through several rooms for some time, and then release in the different room. Later you may even go outdoors, walk around the house, or even put the carrier in the car, without starting it. Remember it’s all gradual. Later you can tart your car’s engine without going anywhere. Then you may try moving back and forth in your driveway or driving around the block, or two. Monitor your cat’s behavior most time. This is what tells you how rapid you may proceed. Are you ready for visiting a vet? Well, our suggestion would be visiting some nicer place. And, while no other place than home feels nice for cats, visiting your grandma or your friends may seem nicer than visiting a vet. And yeah, talk to your vet. Maybe you can arrange visiting the clinic without doing anything to your cat? It shows him that it’s not always bad, but this is a different story. 7. Repeat it on a every now and then. 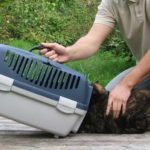 While most cats visit vet clinic once yearly, and see no pet carrier at all the other time, your cat may forget he was able to tolerate the carrier. You have still keep the carrier accessible, and keep walking him in it or driving somewhere every now and then. Don’t overdo it, though. Just because your cat is able to tolerate rides in carriers, does not necessarily mean he has to be taken whenever you go with him. Remember, when we say: “There’s no place like home”, it’s just a saying. When cats “say” it, they really mean it. Most likely you already noticed that this training process takes a ton of time and patience. In some cases, it may last for longer than a year. But what if you need to visit a vet, or some other place right now, right instantly. 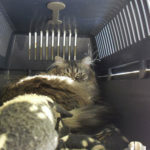 See our photo article where we show you how to get a cat into a carrier when he’s not at all willing to do so. If you do it right, it is not painful to you. However, if you are in the middle of the process described here, be ready to drop back in it. In many cases, you may have to start again with a cat that is even afraid to look at the carrier, not even talking about going into it on his free will. Good news is – the overall progression will be way quicker this time, because your cat still remembers what good can he get out of it. Why your cat hates his pet carrier? What Size Cat Carrier Do You Need? 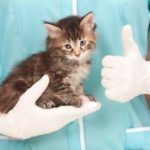 How to take your cat to the vet without stress?